Search the Conserved Domain Database for your term(s) of interest, e.g., voltage gated chloride channel. 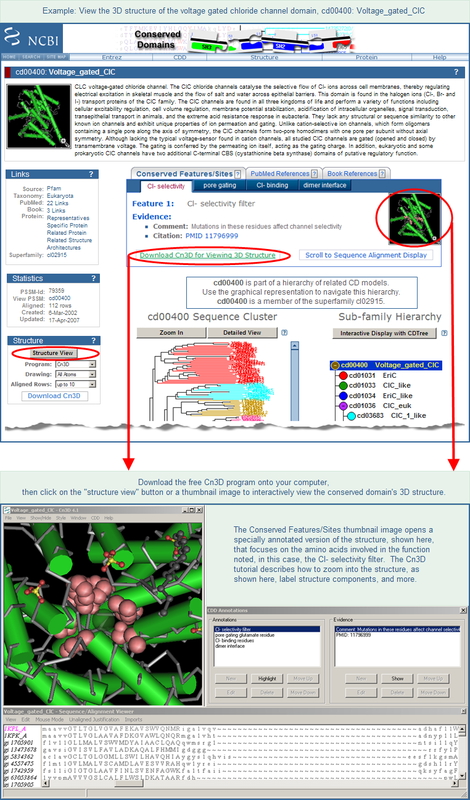 Limit your search results to NCBI-Curated domains, which include 3-dimensional structures and conserved core motifs, by adding the following criterion to your query at the top of the search results page: AND cdd[Database], and press the "Go" button. Click on the accession number of any domain of interest on the search results page to open its CD summary page (example shown below). If the summary page for a specific conserved domain model does not include a 3D structure, see additional notes below. Additional Notes: In a multi-level domain hierarchy, the 3D structures might be present in the parent node (e.g., cd00400) if they are not present in an intermediate or terminal node (e.g., cd03683). In that case, click on the parent node to view structures. If your original search only found domain models from source databases other than the NCBI-curated data set, and if those models do not include protein sequences from 3D structures, you may be able to find 3D structures for homologous proteins. To do that, identify a protein of interest from the domain model's multiple sequence alignment and then follow the steps outlined in method 2 of "How to retrieve 3D structures for a gene or protein product of interest". Be sure to focus on 3D structures whose alignment footprints overlap with the conserved domain region of the query protein, as opposed to another sequence region.